Secure on the outside while meeting your needs for functionality on the inside, LD Systems provides safes of all sizes. Left or right swing doors, any color, traditional key locking combination locks, electronic locks and time locks are available. Whatever your needs may be, our equipment professionals can assist you in designing a safe that delivers maximum security with exceptional functionality. 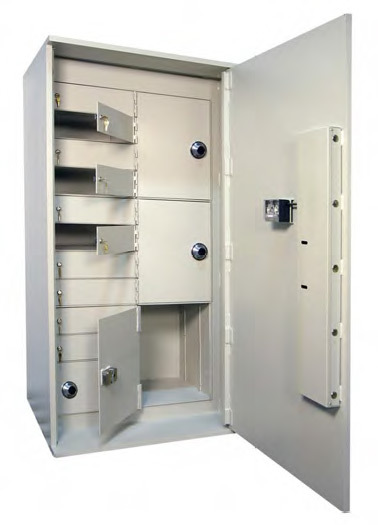 Safe interiors can be configured to provide maximum utilization combining open shelves, cash lockers, teller lockers and pull out drawers to organize currency, coin and vital documents. All teller lockers come standard with single nose locks and cash lockers with combination locks unless otherwise specified.